The concept of “eternal” style is a bit of an oxymoron, after all, many of today’s producers and designers roll out new and improved models on a regular basis. Thinking about cars, phones, and electronics it is easy to fall prey to the idea that everything is expendable and that each new item is better than the last. However, is this really the case? Is there anything that has survived the millennia that is still relevant today? I propose that the klismos chair, like this 20th-century example in Cooper Hewitt’s collection, supports the idea of eternal design. The klismos chair was common in ancient Greece in the period around 400 B.C. These chairs were such a fixture that the klismos form is depicted on tombstones like the Stele of Hegeso (c. 400 B.C.) or the Stele of Xanthisppos (ca. 430-20 B.C). Ancient representations of the chair, whether carved on stone reliefs or painted on Greek pottery, have influenced revivals over the centuries. This chair designed by Terence Harold Robsjohn-Gibbings was manufactured about 1965, in the middle of the 20th century. A quick comparison of Robsjohn-Gibbings’ modern take on the form and an example from early history shows their essential similarities. The classical klismos chair has three defining features: curved, splayed legs that flare outward, a concave back rest meant to conform to the body and two vertical curved rails supporting the back. The Robsjohn-Gibbings chair has a concave back and a webbed leather seat, supported on splayed, tapering legs. The back is composed of curved rails and a simple back splat of similar thickness, placed perpendicular to the crest rail. The mid-18th century saw a growing public interest in the classical world and archeology. Excavators began to unearth ancient Roman cities that were covered in volcanic ash, and the aristocracy visited such sites as they indulged in the Grand Tour. This brought a great surge in popularity for classical art. Many artists and designers traveled abroad bringing back ideas that launched neoclassicism. Greek and Roman Revival styles became widely popular in both Europe and America, referred to as English Regency, French Directoire and Empire, and American Federal and Empire styles. One of the first modern glimpses of klismos chairs was in Paris, as the painter Jacques-Louis David had an example made in 1788 to be used for his paintings, as seen in Portrait of a Young Woman in White. In London, Thomas Hope, an innovative designer and collector, helped to define what is understood to be Regency style. The klismos chair appeared in Hope’s book, Household Furniture and Interior Decoration, in 1807. In America, klismos chairs were incorporated into the Federal style sweeping the country between about 1785 and 1820. In Philadelphia a set of chairs were designed by Benjamin Henry Latrobe in 1808 for a private client and then in 1809 he designed chairs for the White House. At the same time, John and Hugh Finlay of Baltimore were also crafting klismos chairs. Both Latrobe’s chairs and the Finlay brothers’ chairs featured decorative painting on their surfaces, as compared to chairs being produced by Duncan Phyfe or John Hewitt in New York. Over the years classical revivals have come and gone, yet the klismos chair has remained a constant. 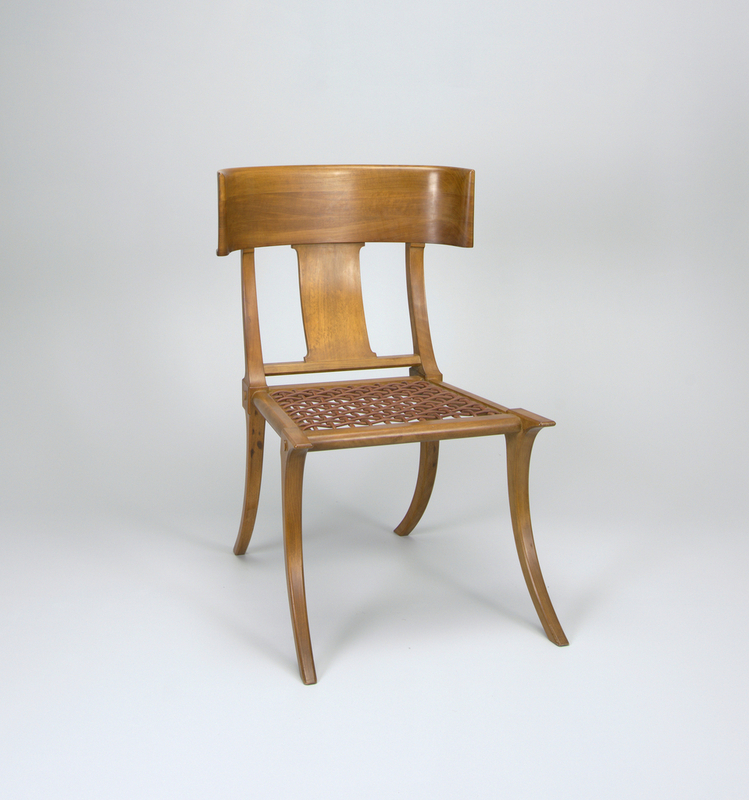 As Modernist design turned toward the rigor of classicism, it blended with Art Deco streamlining to produce chairs with the simple lines of the klismos. Klismos chairs for a sitting room, by Danish designer Edvard Thompson, appeared in Architekten in 1922. Thomas Hope’s style influenced the Regency Revival of the 1920s and 30s. In 1960, British designer, Terrence Harold Robsjohn-Gibbings, met with manufacturers Susan and Eleftherios Saridis to create a line of furniture based on the klismos form. The chair in Cooper Hewitt’s collection is one of these. Whether or not there is anything that can define eternal style, the klismos chair has been “in style” for the better part of the last 2,500 years.